Charlotte Janowski is a fine artist and creative director. 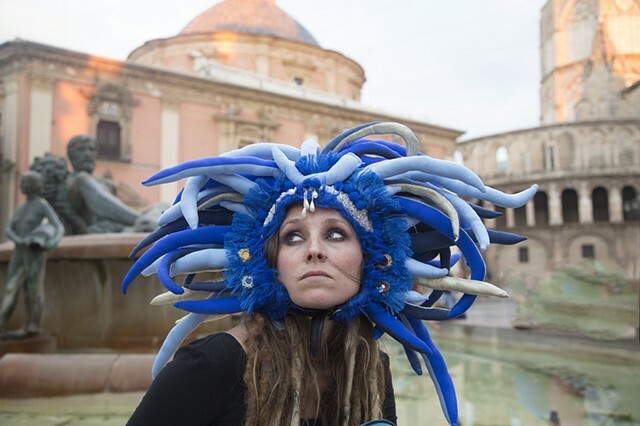 She is known for creating otherworldly masked performances based in archetypes. She works with dancers of all modalities. The work explores the use of the masks as tools for awareness. They allow the anonymity to explore uncharted self-states, in service of creating new narratives. The artist uses these sculpture-skins to facilitates the experience of shapeshifting, causing one to forget their personal narrative in service of re-births. This skin shedding makes space for the spirit-essence to emerge; and for expanded embodiment. The masked beings are Psychopomps, anthropomorphic beings of funerary arts. They are protective guardians; like presiding deities depicted around the edges of Buddhist thangka paintings, who form a barrier for the practitioners psychic exploration. The mask sculptures are the performance-art version of the Rorschach test. Charlotte is a Boston based artist, living and studying Bharatanatyam in Boulder, CO under her guru Laurissa Vibhuti.